The surface of a National Cycle Quantum hardcoated motorcycle windshield is so smooth it has significant water shedding capabilities over all other windshield materials. So it was a challenge for National Cycle chemists to produce a rain repellent product that would have a measurable difference and still be safe to use on plastic material. After years of experimenting in our lab we are proud to bring to the motorcycle industry RainZip rain repellent. The effectiveness of RainZip is formulated for Quantum hardcoated windshields but is safe and effective to use on any windshield. RainZip is hydrophobic. When rain accumulates on your windshield, RainZip will cause it to quickly bead up and blow away, even at speeds of only 35MPH. 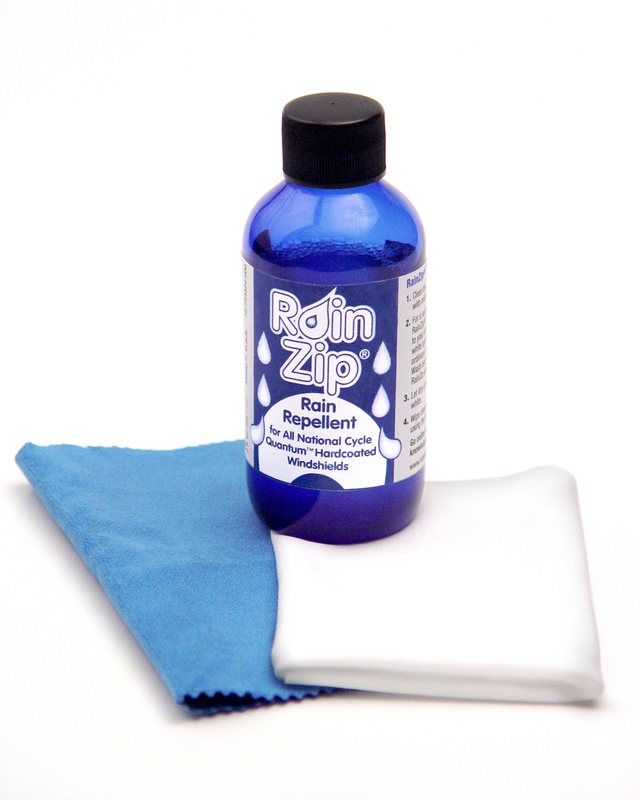 RainZip is available in a 3-oz. bottle size with special application cloths. This is enough for two large windshield applications, each lasting 3-4 months.